Normally when people look into getting into falconry they have a lot of questions. We have tried to answer some of the more basic questions here in a general fashion, but in an activity such as falconry, it would be difficult to thoroughly cover every aspect or inquiry that might arise. We urge you to contact the IFA if you have further questions that are not noted here. Along with a brief summary on falconry and the birds used in it, we’ve also included some contact information for the Iowa DNR, how to find a sponsor in your area, and some recommended books and reading material for those just starting out. Falconry or hawking, is an age old activity of hunting with a trained bird of prey. It originated well before the invention of the firearm, and was a way to put a limited amount of food on the table for its practitioners. With the advent of the gun, a more effective means of hunting and food gathering became available, and falconry became more of a recreational activity. It would be difficult to describe the sport in such light-hearted terms today, as it is considered anything but recreational by many of its followers. It tends to arouse the passions of those who participate in it, and has been termed an art by a number of people. Contrary to a popular perception, falconry is not pet keeping. Actually, nothing could be further from the truth. Although a very strong bond can develop between the falconer and the bird, the primary focus is on taking the hawk or falcon to the field and hunting with it. The famed naturalist, Aldo Leopold, once called falconry the “perfect hobby”, and it certainly does provide an up close and personal look at the natural world. It might best be summed up in the words of one interested gentleman who stated that it appeared to be a very advanced form of bird watching! What birds are used in falconry? At one time or another, one could assume that attempts have been made to fly most types of raptors in falconry. Traditionally however, only certain types of falcons, hawks and eagles have been used for hunting. The family of falcons, used in the sport, range greatly in size and in their overall approach to hunting. All of the birds mentioned here have the notable feature of long, pointed wings, and are therefore often referred to as Longwings or longwinged hawks as well as their more common name of falcon. The largest of the lot, the Gyrfalcon is said to be the fastest of all raptors in straight and level flight. They love the thrill of the chase and can pursue quarry over long distances. There are three distinct color phases of the Gyr, ranging from pure white to black, with the grey phase being the most common. The bird most synonymous with falconry is the Peregrine falcon. High, waiting-on style flights with dramatic stoops or dives are the preferred hunting method of this falcon. Add to this the Peregrine’s manageable disposition, and its no wonder that this has been the bird of choice for many falconers throughout history. Similar in size to the Peregrine, the Prairie falcon of the western plains is also an able bodied game hawk. Their reputation for hitting their prey extremely hard is one attribute that many falconers seem to favor. Their temperament however has been noted to be inconsistent and as such, they have not gained the popularity that some falconers insist they deserve. On a much smaller scale, two falcons continue to be popular choices for falconers that are interested in chasing smaller game like starling and sparrow. The Merlin, a bird noted often in falconry lore, remains a favorite for the sport in the 20th century. Like the Gyrfalcon, the Merlin prefers to tail chase its prey. It also has a habit of caching it’s catch, and modern day handlers often get a number of flights in a single outing. The smallest falcon in North America, which rounds out this list of longwinged hawks, is the colorful Kestrel or Sparrowhawk. This dove-sized raptor is often seen sitting atop telephone lines or hovering over a roadside ditch. It primarily hunts small rodents and insects but will on occasion chase small feathered prey. In falconry, it has been used to pursue small birds like the common sparrow. Two classifications of hawks are commonly flown in falconry and these are known as Buteos and Accipiters. Buteos, or broad-winged hawks, include the Harris hawk, the Redtailed hawk, and the Ferruginous hawk. Most apprentice falconers are required to fly a Redtail for two years while in training. They are large, hearty raptors and can handle the mistakes that every beginner is sure to make. The fact that they can be found throughout North America also makes them widely available. The Harris hawk, which is native to the Southwest U.S., has become a worthy hunting partner in the last several decades. Commonly bred in captivity, they are considered very biddable and are capable of taking a wide variety of game. Ferruginous hawks from the western plains states have been found to enjoy waiting-on flights like some of the aforementioned falcons. Like the other Buteos, it is large enough to capture ground-based quarry like rabbits and squirrels. Three birds make up the Accipiter, or shortwing clan. They earned this title by having a shorter, more roundish wing than their longwing counterparts. All three are built for high speed, agile flight in timber or forest. A longer than average tail helps them cut quickly through their preferred habitat. The Goshawk, which is the largest shortwing, is an able hunter of both ground- based prey as well as gamebird and waterfowl. In olden days, this was the hawk that was often counted on to fill the larder and put ample food on the table. Second in line, and often referred to as the proverbial “chicken hawk” by laymen, the Cooper’s hawk is a bird specialist. Like the Goshawk, it is extremely quick on the wing, and often takes its prey by a lightning fast attack that catches its target by surprise. Quail are a popular favorite of falconers that regularly fly the Coops. The Sharp-shinned hawk, like the Merlin is a small, but able predator. It too loves the thrill of a direct high speed pursuit. Starlings are often the target of hawkers who work with Sharpies, and many farmyards in the midwest are a prime hunting ground for this species. All of the birds that we’ve noted above are commonly used today in North American falconry. We’ve chosen to focus only on the naturally occuring species that are found in the wild. With particular regard to the falcons, modern day captive breeding techniques have made it possible to cross certain species and provide falconers with a wider range of choice. Of these crosses, the Gyr x Peregrine hybrid falcon has become very popular in recent years.With that said, it still remains that the primary factors regarding the choice of what type of bird to fly are the falconer’s preferred flight style and the type of game they might have available to pursue in their area. As a final thought, we will mention that Eagles have also been flown in falconry throughout history. They are extremely large and powerful birds and are best left in the hands of falconers with a wealth of time and experience. In the U.S., only the Golden Eagle has proven to be an able hunter while used in falconry. Does falconry affect raptor populations? One question that gets asked from time to time, is the effect of falconry on raptor populations in the wild. It’s an understandable question to ask, for anyone who has a concern about wildlife, and in particular, birds of prey. For those concerned, the good news is, falconry has had no negative impact on raptor populations. Still the question comes up from time to time, and is often fostered by misinformation from long ago. Dating as far back as the early 1900’s, a bit of a propaganda campaign has fostered the belief that falconry or falconers have adversely effected birds of prey. In the early part of the last century, oologists, or egg collectors, put a bit of strain on species like the Peregrine falcon in certain locations throughout the eastern United States. A fued developed between falconers and egg collectors because the birds had begun to disappear. Each side blamed the other for the decline, but unfortunately, egg collectors often got the prize long before the falconers. As each clutch was laid, they were taken up, and eventually no young were produced to replace the older falcons. By the middle of the century, Oology had died out, and with the threat having disappeared, the falcon populations rose to normal levels once again. In the decade of the 60’s another threat arose, and once again, some felt that falconers were causing the peregrine’s numbers to decline. This bogus statement has continued to be used from time to time, even to the present day to describe the falcon’s demise. Yet, it’s well known, and documented that DDT and other chemicals were the culprit. Like the oologists, but on a much larger scale, if something wipes out the yearly production of a species, it is’nt long before that species is in peril. In the early 1990’s, the United States Fish and Wildlife Service conducted a study, that conclusively showed that falconry had a neglegable effect on any raptor population. As our conservation section of this website will show, falconers have actually had a very powerful and positive role in helping a number of species grow in mass, most notably, of all things, the Peregrine falcon. Perhaps the best example of a falconer’s relationship and impact with a bird of prey might best be outlined in the typical aquisition of a Redtailed hawk. As fall approaches, young birds, having left the nest only 60 or so days before, have the instinct to begin migrating to the south for the winter. If they have survived into September and October, they have at least begun to hunt effectively on their own. Still during the fall, and the first winter of the young bird’s life, the odds are extremely high that it won’t survive. Estimates indicate that up eighty percent of the birds born in the spring, will not make it to one year of age. This high level of mortality often comes from the demands that cold winter weather puts on the birds. The likelihood of starvation increases as the temperature drops and available food sources get harder to come by. This, coupled with a number of other factors, such as injuries, diseases and persecution from man, lead to a heavy toll in a bird’s first year or so. In a bird’s second year of life, the odds do tend to improve. Their hunting skills continue to be refined and perfected to a point, where survival is not threatened as much by the slow and agonizing onslought of starvation. Indications are, that another ten percent of the birds will die in their second season however, so this generally allows for the remaining ten percent to go onto breeding age and beyond. This high mortality rate will fluctuate somewhat, depending upon the weather and environmental conditions. If the winter is mild, and an adequate prey base is available, the odds will do nothing but improve. Nevertheless, survival demands a great deal from a bird of prey, as skill and luck all play a part. In Iowa, state and federal law, requires that only first year, or “passage” birds on their first migration south, may be used for falconry. In the case of the Redtail, a bird would be obtained in late September or October on the migration, and be trained and hunted throughout the winter season. In most cases, once spring has arrived, the vast majority of these birds are once again released back into the wild when the northerly migration is taking place. In effect, the bird has been assisted and sustained throughout the most difficult period in it’s life. It’s hunting skills will continue to be tested, refined and improved, while being cared for by the falconer, and once released, it’s chances of survival are greatly enhanced. Even without this particular form of assistance, as was noted earlier, federal studies have indicated that because of the low number of people participating in falconry, and the abundance of birds of prey, there is no negative impact on raptor populations from falconry. It should also be noted that the study indicated that falconry has had no negative impact on game species as well. Hopefully this adequately answers the question of a falconer’s impact on the environment. Without question, the vast majority of practitioners are stout conservationists, believing that while out natural resources are, and should be, available for use, they should also be conserved, respected and cherished as the treasures that they really are. What does it take to become a falconer? Well, first it takes commitment. A commitment of your passion and attention, as well as your time. It takes having the space to construct appropriate housing facilities as well as the financial means to acquire the necessary equipment, and it takes ample access to safe areas for hunting and training. To put it simply, if you don’t have the above attributes, it would be hard to practice and enjoy falconry. So, it takes quite a lot to become a falconer. Think long and hard, about your ability to commit to such an activity. Also remember one key point, falconry is not pet keeping…it is hunting…therefore, if your not intending to hunt with a bird of prey, falconry is not for you. With that said, if you still choose to pursue the sport, there’s a general path that all falconers will follow to get a permit to practice the craft. First and foremost, falconry is perhaps the only federally mandated system where an aspiring person must find an experienced sponsor to take them on through a two year apprenticeship period. Finding a sponsor is not usually a difficult task. They must be listed as either a general or master class falconer, and if possible, live nearby and be available to help the beginner through the training processes. You can contact us via email to begin the process of finding a sponsor in your area. After finding a sponsor, it’s required that an applicant must pass a federal exam. It consists of approximately one hundred questions pertaining to the care, management, and identification of raptors in general. Upon passing the exam, facilities and equipment must be inspected and pass both federal and state guidelines before a license is granted. Throughout this entire process, an applicant will often rely on both printed study materials and the sponsor’s input to help pass all the necessary requirements. 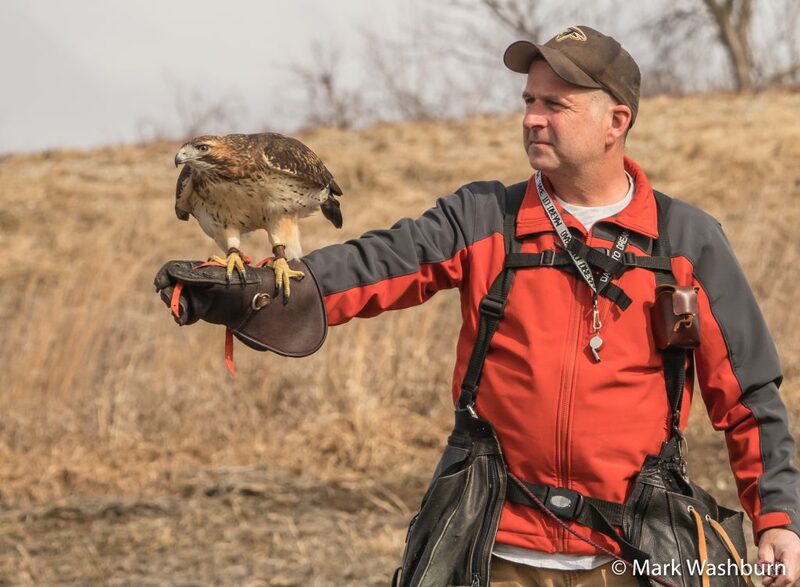 With the issue of an apprentice permit, the new falconer is then able to attempt to acquire an immature passage Redtailed hawk (Iowa requirement), and this is common for most of the lower 48 states. It’s often encouraged that apprentices in Iowa fly a hawk for one season, then release it back to the wild in the spring. The acquiring and training of a second bird the following fall, will usually allow them to learn a bit more by going the process again for a second time. If the birds are successfully taken to the field and hunted, an apprentice is then signed off by the sponsor after two seasons and can then graduate up the the general class level. While it’s uncommon, occasionally people do not pass through the apprenticeship period. It should be remembered that it is, after all, a proving ground and learning period. If an apprentice should lose sponsorship at any time due to negligence or poor management, it’s unlikely they’ll practice falconry again. Above all things, a bird’s welfare comes first, and poor management will not be tolerated in falconry. After passing the apprenticeship level, a falconer then holds a general class license for a five year period. Other birds, besides the Redtail are available for use at this level. Following five years of activity at the general class, a falconer then attains master status, which is the highest federal level available. 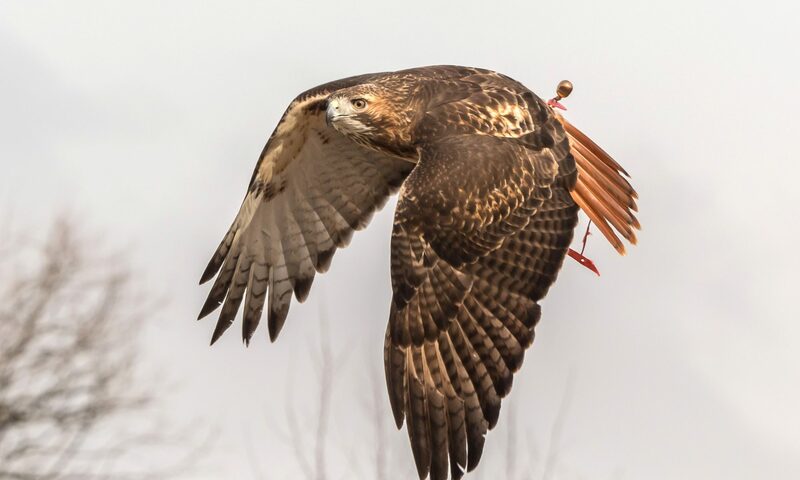 For more detailed information on the class levels, requirements and benefits, contact your state wildlife agency for a copy of the state/federal falconry regulations. Who should I contact for more information on licensing and other requirements? While most states regulations are based on the federal mandates, many have minor differences between them. Generally you can contact your state fish and game or natural resources department for more information. For Iowa residents you’ll want to contact the Iowa Department of Natural Resources falconry director at the following address Aron.Arthur@dnr.iowa.gov . Also, since you’ll be required to have a valid, Iowa hunting license when practicing falconry, you’ll want to begin the process of acquiring this permit as well. Iowa law requires that anyone born after January 1, 1972 must be certified in hunter education before they are eligible to purchase an Iowa hunting license. What books or periodicals are recommended for learning more about falconry? There are a number of good books on falconry that are available to anyone interested in learning more about falconry and it’s practice. There are several we would recommend for a beginner. Those in Bold print are highly recommended for the novice. A Bond With The Wild by the North American Falconers Assoc. Thanks once again for visiting our FAQ page. If you have further questions or would like to see something added here, please contact the IFA.